More than a dozen are hurt as a fireworks display goes wrong in Amesbury. 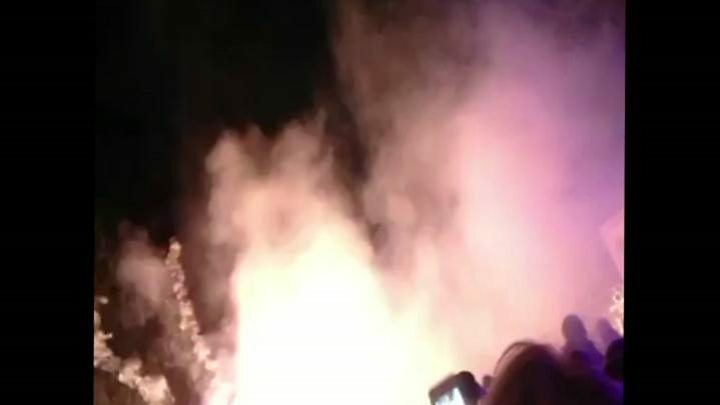 The organisers of a bonfire event where 14 people were hurt say they are "saddened" by the upset and injury caused.The display at the Antrobus Hotel in Amesbury, Wiltshire, on Saturday night was cancelled soon after a box of fireworks malfunctioned.A number of young children were among those injured with some parents saying they were "traumatised".Wiltshire Council is investigating and the hotel is reviewing procedures.Stephen Fitzgerald, director of Fitzbride Ltd, which runs the hotel, said: "This incident, which was caused by a faulty firework box detonating on the ground, was highly regrettable and I would like to commend the team on duty, who called the emergency services and rendered aid in what was otherwise extremely challenging circumstances. "The whole team is saddened by the upset and injury caused on what should have been a happy evening. "Our focus now is liaising with those affected, the fireworks supplier, as well as reviewing our procedures and completing a thorough investigation to ensure that incidents like this do not occur at events held at other venues." Katie Millward was sitting near the front of the fireworks display when the incident occurred. She said: "We arrived early and when we sat down we were outside the cordon, but as more people arrived it kept getting moved. "There were so many children screaming and crying, and a very high sense of panic. "A firework exploded on the bench in front of us and we ran to the pub but all the doors were locked. "Mr Fitzgerald said a full risk assessment had been carried out ahead of the event and the hotel's safety cordon was double that specified by the manufacturers.He added that despite concerns about overcrowding, the venue was below capacity.He said: "All four fire exits at the rear of the hotel were available, however we appreciate that in the rush to get inside some persons may have had difficulty in operating the doors - which we will be reviewing. "The Health and Safety Executive said it would only investigate if the council decided it was appropriate.